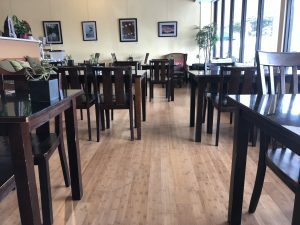 A busy cafe is a harsh environment for hardwood and bamboo. This floor in Mill Valley had grayed in color and looked like it needed to be replaced. Fortunately, our talented team refinish the existing bamboo floor, bringing it back to its original beauty, and saved the cafe owners both time and money.